With temps nearing 80 degrees in March fer gosh sakes, turning on the a/c may be a temptation, but for now a fan is a nice compromise in this "shoulder" season. Two years ago the Dyson vacuum people introduced a pricey $300 tabletop 10-inch bladeless fan. At the time Dyson had an exclusive patent on the technology, so any prospects for cheaper models were nil. But Thursday KGB Deals offered a Breeze Right fan that looks identical to the Dyson for $79. Anyone who was holding back on spending $300 might want to take a second look at the less expensive version. I haven't tested the Breeze Right, so I can't confirm that it's the same fan. Dyson customer service reps say that Breeze Right is not made by them. The KGB Deal, which runs through April 12 while supplies last, is for two sizes of tabletop fans, 10-inches ($79, reg. $179) and 16-inches ($89, reg. $199). Each is available in white, silver or blue. The Breeze Right fans are also available on Amazon for about $50 more than KGB's deal. Unfortunately, no one has reviewed the Breeze right versions. The Dysons get generally favorable reviews on Amazon, Target.com and Bedbathandbeyond.com. Most people praise the fact that a bladeless fan is safer, cleaner and quieter. As you can see in the pic, there are no blades for kids or pets to stick their paws into. And no blades and grill to attract hard-to-clean dust and grime. The speed control is a knob similar to a volume control, not a 3 or 5-speed model. Most reviewers claim the Dyson bladeless is quieter, but a few found it as noisy as any blade fan. Not noisier, but just not any quieter. Why consider it then? It's safer and cleaner. Since the Breeze Right model is being purchased through a daily deal site, is it returnable if you're not satisfied? Yes. You have two weeks from the date of receiving the item to return it for credit or a refund. There is no restocking fee but the buyer pays shipping costs to return it. 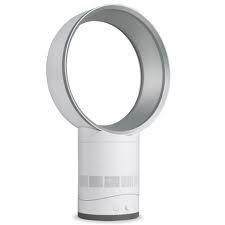 Anyone purchased a Dyson or Breeze right fan and want to weigh in?